Amelia Island Plantation was made in the shade. 29 miles northeast of Jacksonville International Airport the secluded, natural, active Florida resort lies literally under a twisting canopy of lush, green trees draped with hanging Spanish moss. The grassy sand dunes, unspoiled beachfront, lakes and seas of marshland are the resort – with the inn, homes, villas, and resort amenities tastefully tucked under, in and around the natural features. Guests can play tennis or golf, surf, kayak, hike, swim, shop, sail, bird watch, go fishing, ride horses, work out, dine, enjoy the spa or simply “veg out” amidst 1,350 acres of vegetation between the ocean and the Intracoastal Waterway. Amelia Island Plantation is the Sunshine State’s most restful active resort. It’s popular families, conference-goers, and wedding planners because you needn’t touch a steering wheel during your entire stay. We rode a resort shuttle van from the airport while its’ cheery driver, a Swede named Jan, briefed us along the way by giving us the lay of the land and resort tips. It was Jan who advised us that the resort’s aviation-themed bar, called the “Falcon’s Nest,” would be the best place to watch the local favorite Florida Gators take on Alabama in the SEC Championship football game on an outdoor patio with wings and beer – and he was right! It was a discovery all our own, though, when we spotted pelicans dive-bombing fish in the Atlantic from the fifth-floor balcony of our guest room in the 249-room Amelia Inn. Closer inspection during a sunrise beach walk revealed the fins of playful dolphins bobbing only 20 yards from shore! As low-density as the resort is, it’s astonishing to learn that 360 other hotel rooms and condos are hidden in the trees along the fairways and grassy waterways. Golf professional Dean Grunwald, who has been with Amelia Island Plantation for nine years, loves the variety of the golf offered. “We have four courses designed by Pete Dye, Tom Fazio, Bobby Weed and Tom Jackson – four great golf architects,” he told me. We played Weed’s “Ocean Links” course, which led us out to the beach for five scenic holes running along the ocean. Six fun par-three holes made the thoughtful course enjoyable and not too testy. Major tennis stars, including Andre Agassi, Maria Sharapova, and Serena and Venus Williams, have also competed at Amelia Island Plantation, which hosted the World Tennis Association Championships. 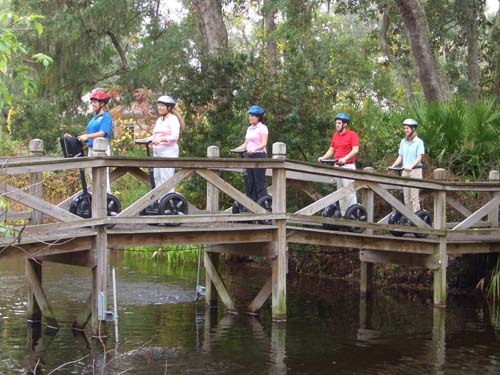 Amelia Island Plantation is a great place to try new things. For me, it was a Sports Pedicure in the spa. “What’s not masculine about this?” my therapist asked as she attended to my feet. “Once a man has his first pedicure he will want pamper his feet forever.” Convinced, I was about ready to sign up for the Aqua Chi and Himalayan Salt Stone Massage when I realized I could try fly casting, deep sea fishing, or hop on a Segway and zip quietly through the natural areas, dunes and scenic boardwalks. Having said that, detoxification, deep relaxation, reduced inflammation, balanced energy, and the overall sense of well being through the placement and movement of warmed stones positioned on my body promised by the massage sounded tempting, too! For others, I’m sure the “Organic Chocolate Romance Ritual for Two” is just the right thing! Just south of the Georgia border, Amelia Island is not a tropical resort, so it’s much more complex and sophisticated than the typical strong bikini/frozen daiquiri Florida resort cliché. When the summertime temperatures do soar, Amelia Island has the best of both worlds – a broad, bright beach next to a shady oasis. Amelia Island Plantation is a refreshing, healthy, quality experience – and Audubon certified. You won’t see the forest for the trees! Snorkeling as good as diving have been the prominence of the activities. Snorkeling area have been located in the south easterly (opposite-facing the Lombok Golf Kosaido) as good as along to the north east).